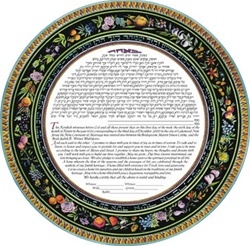 Vibrant colors of this ketubah depict fruits and flowers which represent the commandment, "Be Fruitful and Multiply". Simcha Back, a largely self-taught artist, developed his talent while still a Yeshiva student. Cutting from many different sources, both traditional and modern, he evolved a style uniquely his - a combination of flowing colors and fine details that forms pieces of outstanding beauty. Simcha has had his artwork displayed in virtually every major city in the United States. His clients have come from almost 20 different states, and a dozen countries including England, Belgium, Israel, and Australia.